This is a great website for those of you looking for green stuff to give this holiday season. 2007 could go down in history not as the year when consumers started paying attention to the environment, but the year when companies started marketing all sorts of useful and completely useless green-theme gadgets to the public. Here are a few of our favorite gadgets released this year that will lower your electric bill and save a tiny bit of planet earth. 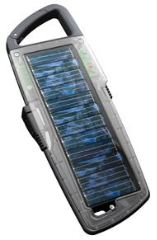 It seems like every time we blink one company or another is coming out with a solar powered charger for your cellphone, laptop, or other portable electronic devices. The Solio Hybrid 1000 is a $70 charger that lets you power your gadgets on the go. A fully charged device should power your iPod for 10 hours of playback. Or one hour of sunshine should provide about 15 minutes of cellphone talk time or 40 minutes of MP3 playback on a portable media player.